Summary : A uniquely aromatic and flavored tea, the Pumpkin Rooibos tea certainly stands out as "different." Yet, the aroma is great and the tea has a interesting, fruity flavor to it. If you feel experimental and want to try something out of the ordinary, this tea is a good tea to have. Review : I have been feeling experimental all day and all night. So in-between sipping on my favorite teas, I've been digging through my extensive selection of tea samplers. So this morning, somewhat sick of green tea, I really began to look for something that said "different" all over it. And sure enough, soon I came across a Pumpkin Rooibos Tea from the Dragonwater Tea Company, a tea that says "different" if there ever was one. 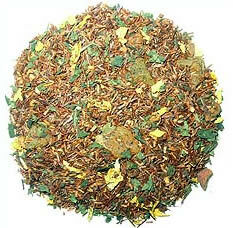 Here is how Dragonwater describes this tea on their website : Rooibos with a fruity pumpkin and cream taste. A must try. This roobios tea contains the following ingredients : Rooibos, honeydew melon cubes, apple pieces, stinging nettle leaves, sunflower petals and natural flavoring. I was really quite intrigued by the list of ingredients here. Melon cubes? As such, I rather eagerly ripped open the package to give this tea a try. The fragrance of this tea is absolutely delightful. I really don't know how to describe it other than a "light melon aroma." Truthfully, I've never smelled such a thing before. But however you want to describe it, I really liked it, all the more so since the fragrance was quite strong. The teas flavor was TOTALLY not what I was expecting. Of course, since I had no clue on what to expect, I guess this is probably not entirely surprising. But still, considering the fragrance and ingredients of the tea, along with the teas name, I think I built up some sort of strange expectation that this tea might taste a little like a "fruity pumpkin pie." This tea had a surprisingly pleasant flavor to it. The tea does indeed have a light fruity flavor, but in no way compares to a true "fruit tea," let alone a whole fruit tea. But that's ok here. I actually enjoyed this light fruity flavor the tea had, as it didn't over-ride the other "unique flavor" of this tea, which can be best described as a moderately light, creamy pumpkin flavor. Yes, you read right. I've tried many teas that were supposed to be creamy, but none lived up to the expectation. But this tea did. And the mixture of the light fruit flavor, combined with this light, creamy pumpkin flavor produces a highly unique taste you won't find elsewhere, that's for sure. Another intesting thing in this tea...you won't taste the rooibos whatsoever. Recently I've had a number of highly flavored rooibos teas, yet call it bad luck or something, the flavor of the rooibos really did over-ride the flavoring that had been added to the tea. Not here. In this tea, the flavor of rooibos is basically absent unless you really want to go hunting for it. Thus, the moral here is if you want the flavor of rooibos in your tea, you won't find it in this one. Recommendation : Yes. If you feel experimental and want to experience in your life something out of the ordinary, well, this tea is certainly a good one to try. Of course, you better like pumpkin, because the moderately light, creamy flavor of pumpkin is quite distinct in this tea. Thus, if pumpkin isn't your thing, you won't enjoy this tea.